So today brought another whiff on two economic data points - trade deficit and ADP. I think the ADP # has been the worst jobs related data source released to the public in the past decade and the ADP miss probably means a GIANT jobs number on Friday but once again stocks are taking it all in stride with just a minor dip at the open. I thought it would be worth mentioning that there needs to be a little context around all of the "NEW RECORD HIGHS FOR STOCKS" stories that pop up every time we close higher. Do you know what the year to date return for stocks has been this year? Not exactly soaring to the moon after nearly half of the year. Yes, stocks have rebounded sharply in the past couple of weeks - mainly on hope of more Fed intervention or Japanese Central Bank easing - but given that stocks began the year near record levels the gains haven't been nearly as robust as one might think if you just read the headlines. There is a fairly lengthy debate going on in the twitter world about the strength of corporate profits. 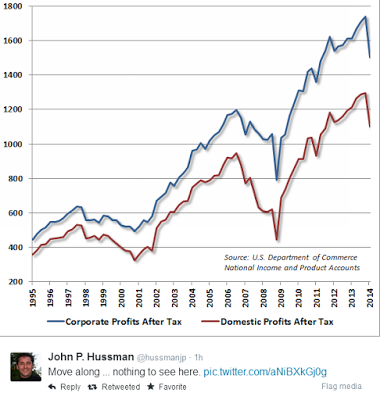 John Hussman tweeted this picture last week to illustrate his point. This appears to be tied to the expiration of various investment incentives that allowed companies to accelerate depreciation of investments (ok, I can see your eyes glazing over - suffice to say the gov't gave companies tax breaks in 2002, 2003, 2008, 2009, 2010 and 2012 to keep investing in their businesses). Those tax breaks went away this year and thus, spending has declined and profits have followed. Do you think someone will be lobbying for another round of corporate tax breaks in 2015? It's hard to do that if stocks are at all time highs but if they fell 20-30% well, that might get some attention in Congress. So how are companies managing to grow during this period? A little smoke and mirrors is the simple answer. Let's say you are company XYZ and you earn $100 and have 1,000 shares outstanding. Your earnings per share are $0.10. Now let's say business was a bit soft and you earn just $95. Yikes, earnings fell 5%!!! However, being the clever financial magician that you are, you saw this coming and bought back 100 shares of your own stock this year instead of maybe investing new technology or equipment or a better salesforce. Now you still earned just $95 but you only have 900 shares outstanding so $95/900 = $0.1056/share. Earnings per share didn't fall 5% the ROSE 5.6% WooHoo!!! Champagne for everyone. While this is just a simple example keep in mind that in the last 12 months the S&P 500 companies have bought back $500 billion (yes, with a B) of their own stock to change the denominator in that earnings calculation. The only other time companies bought back this much stock??? 2007. What was happening in 2007? Oh, that's right, we we were slipping into recession (although no one would know that until 2008) and earnings were stalling so buybacks were the only way to sustain the illusion of growth.